From the ruins of what used to be North America, a new nation was forged by survivors of the Fall. They called this new nation the Covenant, and two centuries later, it is stronger than ever. The Moon people, descendants of lunar colonists who returned to Earth to rebuild it, rule with an iron fist, to ensure their dominance over the original inhabitants, the English. For the Covenant is a nation where a chosen few prosper at the cost of everyone else, and while the English are forced to serve their masters their entire lives, the Moon people have mastered the greatest secret, the secret of life itself. 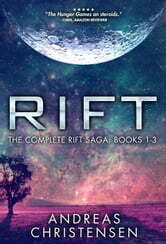 In the Rift Saga we follow Sue and Dave, two English teens sent off to serve, Evan, a soldier and a member of one of the most prominent families of the Moon people, and Mark, the oldest man on Earth, as they find themselves in the midst of events, uncovering conspiracies that have kept the Moon people in power ever since they left their dusty refuge behind. Sooner or later, in different ways, they will all find that lies and deception can only work for so long, and sooner or later the truth will be unveiled. What will happen once the veil of lies unravels? The Rift Saga takes place more than two centuries after the events of Exodus, in a dystopian society forged from the ashes of global disaster. 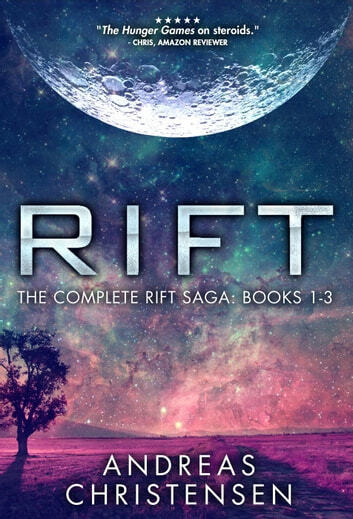 The Complete Rift Saga consists of Rift (Book 1), Covenant (Book 2) and Legacy (Book 3). Hard to put down reading experience. What an amazing story! It was absorbing and so well written and I felt like I was actually there experiencing the fear and courage of the characters. Excellent. Hard to put down. Gives hope that humanity won't be lost to man's stupidity. A good read with multiple character's lives woven together with action and subterfuge. Strong characters with differing backgrounds fight for their place in their devastated world. The author has improved his writing since the Exodus trilogy. This had moments where it was dark but it was captivating the whole way through and I will be recommending it to friends who like Science Fiction.